The Duchess of Cambridge's younger sister Pippa Middleton has given birth to a baby boy. The baby boy - whose name has yet to be released to the public - was born at 1.58pm on Monday (Oct 15), weighing 8lb and 9oz (3.88kg), the same place where her sister Kate gave birth to her three children. Pippa sparked speculation she was due to give birth any time soon when she was spotted heading into the Lindo Wing on Monday. Pippa confirmed she was expecting her first child back in June. She revealed: "I was lucky to pass the 12-week scan without suffering from morning sickness. That meant I was able to carry on as normal. "When I learned the happy news that I was pregnant I realised I needed to adjust my four to five-day-a-week routine. I've noticed my body change but through exercise I feel it's being strengthened. I'm fanatical during pregnancy but have been disappointed by the limited technical information what you can and can't do. "This being my first pregnancy, I had so many questions I felt were still unanswered. I wanted to know things like, would I strain if I served in tennis, are strokes of swimming safe, can I still do a normal yoga class if I avoided certain positions? Could I still work my abs? I've noticed my body change and weight increase, but through effective exercise and sports, I feel that it's been strengthened to support a healthy pregnancy, birth and recovery … And ensure that post-baby, my old favourite jeans will still fit eventually!" Prince William's sister-in-law Pippa is married! Pippa Middleton and James Matthews pose for photographs after their wedding at St Mark's Church in Englefield, west of London, on May 20, 2017. James Middleton, brother of the bride, walks with his mother Carole Middleton as they attend the wedding of Pippa Middleton and James Matthews at St Mark's Church in Englefield, west of London, on May 20, 2017. James Middleton, brother of the bride. Donna Air attends the wedding of Pippa Middleton and James Matthews at St Mark's Church in Englefield, west of London, on May 20, 2017. Spencer Matthews gestures as he stands with James Middleton and Donna Air at the entrance of St Mark's Church in Englefield ahead of the wedding of Pippa Middleton and James Matthews in Englefield, west of London, on May 20, 2017. David and Jane Matthews, parents of the groom, attend the wedding of Pippa Middleton and their son James Matthews at St Mark's Church in Englefield, west of London, on May 20, 2017. Britain's Princess Charlotte, a bridesmaid, attends the wedding of her aunt Pippa Middleton to James Matthews at St Mark's Church in Englefield, west of London, on May 20, 2017. Tennis player Roger Federer and his wife Mirka attend the wedding of Pippa Middleton to James Matthews at St Mark's Church in Englefield, west of London, on May 20, 2017. Britain's Prince William and his brother Prince Harry arrive for the wedding of Pippa Middleton and James Matthews at St Mark's Church in Englefield, west of London, on May 20, 2017. Britain's Prince Harry leaves after attending the wedding. Carole Middleton and her husband Michael Middleton. Pippa Middleton and her new husband James Matthews leave St Mark's Church following their wedding in Englefield, west of London, on May 20, 2017. Britain's Prince William talks to James Middleton. Pippa Middleton and James Matthews kiss after their wedding at St Mark's Church in Englefield. Britain's Catherine, Duchess of Cambridge, follows her sister Pippa Middleton following the wedding of Middleton to James Matthews at St Mark's Church in Englefield, west of London, on May 20, 2017. Britain's Lady Gabriella Windsor attends the wedding of Pippa Middleton and James Matthews. Britain's Catherine, Duchess of Cambridge stands with her children Prince George and Princess Charlotte, following the wedding of her sister Pippa Middleton to James Matthews. Pippa Middleton kisses her new husband James Matthews. Britain's Catherine, Duchess of Cambridge speaks to her daughter Britain's princess Charlotte, a bridesmaid. Pippa Middleton arrives with her father Michael Middleton in a 1951 Jaguar Mk V car. Britain's Catherine, Duchess of Cambridge walks with the flower boys and girls, including Prince George and Princess Charlotte. Michael Middleton stands with his daughter Pippa Middleton. Michael Middleton walks with his daughter Pippa Middleton. Britain's Catherine, Duchess of Cambridge stands with her daughter Britain's princess Charlotte, and the other bridesmaids and pageboys. 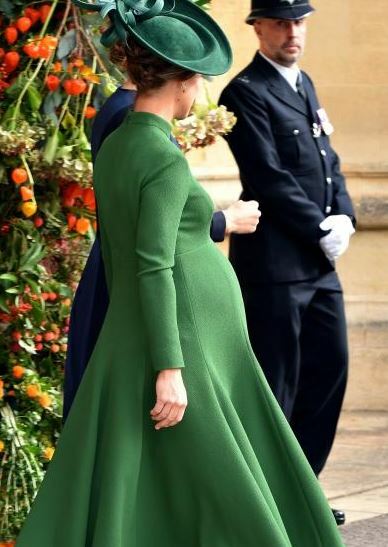 Catherine, Duchess of Cambridge, stands with Princess Charlotte and Prince George, who were flower boys and girls at the wedding of Pippa Middleton and James Matthews. A view of St Mark's Church ahead of the wedding of Pippa Middleton and James Matthews at St Mark's Church in Englefield, west of London, on May 20, 2017. Nanny to Prince George and Princess Charlotte of Cambridge, Maria Borrallo, walks to the church. Gary Goldsmith, uncle of the bride. Britain's Princess Eugenie of York. Britain's Catherine, Duchess of Cambridge arranges the train of her sister Pippa Middleton.